by Mistovich, Joseph J.; Karren, Keith J. For courses in Prehospital Emergency Care. Comprehensive in scope and student-friendly, Prehospital Emergency Care conveys the “WHY” behind the signs and symptoms students observe and the services they provide. Through a solid foundation of pathophysiology, students will learn to quickly identify immediate life threats and deliver excellent emergency care. The 11th edition continues to meet and exceed the National EMS Education Standards. It has been thoroughly updated to reflect the latest and best practices for emergency medical services in the US, including conforming to the latest American Heart Association guidelines. Spine motion restriction, naloxone administration, sepsis, stroke screening tools, human trafficking, active shooter, domestic violence, and clinical decision-making with regard to oxygen administration are just a few of the updates readers will discover in this hallmark text. MyLab™ BRADY is an online homework, tutorial, and assessment program designed to work with this text to engage students and improve results. Within its structured environment, students practice what they learn, test their understanding, and pursue a personalized study plan that helps them better absorb course material and understand difficult concepts. Learn more. Note: You are purchasing a standalone product; MyLab BRADY does not come packaged with this content. Students, if interested in purchasing this title with MyLab BRADY, ask your instructor to confirm the correct package ISBN and Course ID. Instructors, contact your Pearson representative for more information. Joseph J. Mistovich, MEd, NRP, is Chairperson of the Department of Health Professions and a Professor at Youngstown State University in Youngstown, Ohio. He has more than 33 years of experience as an educator in emergency medical services. Mr. Mistovich received his Master of Education degree in Community Health Education from Kent State University in 1988. He completed a Bachelor of Science in Applied Science degree with a major in Allied Health in 1985, and an Associate in Applied Science degree in Emergency Medical Technology in 1982 from Youngstown State University. 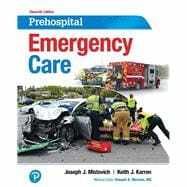 Mr. Mistovich is an author or coauthor of numerous EMS books and journal articles and is a frequent presenter at national and state EMS conferences. Keith J. Karren, PhD, EMT-B, is Professor Emeritus and former Chair of the Department of Health Science at Brigham Young University in Provo, Utah. He has been a professional Health Science and EMS educator and author for 40 years. Dr. Karren received his Bachelor of Science and Master of Science degrees from Brigham Young University in 1969 and 1970 and his PhD in Health Science from Oregon State University in 1975. Dr. Karren was one of the earliest certified EMTs in Utah and helped found SAVERS, a community volunteer EMS ambulance association in Utah. Dr. Karren co-founded the Prehospital Emergency Care and Crisis Intervention Conference, held annually in Salt Lake City for 36 years, one of the premier EMS conferences in North America. Dr. Karren is the author or coauthor of numerous books on prehospital emergency care and health, including First Aid for Colleges and Universities, First Responder: A Skills Approach, and Mind/Body Health.